A mastermind doing the Midnighter arc in Steel Canyon! Once unthinkable, this is a quite ordinary sight now. Whether you become a hero or a villain now depends on your own moral choices, not what powers you have. The spiral swirls around Happy Scientist is his time warping powers, a new powerset in CoH Freedom. Regular readers will probably remember the nameÂ City of Heroes – it is one of the few computer games I still play, and I played it probably every week (holidays and vacations included) for over 7 years, from it was in closed beta and until this summer. With the announcement that the game was going to change drastically, I started to lose interest. It seems I was mistaken though. I must admit I was skeptical when NCSoft announced that the 7 year old online superhero game was going to become free to play, under the name City of Heroes: Freedom. There is no such thing as a free lunch, as the saying goes: Somebody always pays, and in any kind of commerce, that somebody is always the customer. The transition has recently begun, starting with us regular subscribers. We are now called VIP players. When we logged on after the new major update, we could pretty much continue doing whatever we had done before. One little-used newbie city zone has been taken for use as a new tutorial. On the other hand, a new level 20+ zone has been opened. And we now have a brand new server. Just in case 12 character slots on 13 English-language servers were not enough… The point of the new server is that when the free players arrive, we will have an exclusive gathering place for the “elite”, making us feel exclusive. And of course, it is a new start, where every character is new for a few weeks. In addition to the usual content, we get part of our payment converted into “points”, which can be used to buy such things as rare auras or costume pieces. Perhaps the most controversial decision was to let one of the two new power sets only be available for points. Since subscribers get points as part of the package, they can buy this Beam Rifle power without pulling out their credit card again – if they don’t prefer spending the points on other goodies. But usually all main powers are directly opened to subscribers. This is also the case with the other power set in this issue, Time Manipulation. While little has changed for the subscribers – we have a new server and some new shiny stuff – the big winners are the former subscribers who for various reasons have wandered off. These have now “Premium” status. Their accounts are activated again for free. All their characters are mothballed, but they can play a number of them depending on how long they were customers. They keep rewards and mini-expansions they bought before. They can’t play as Incarnates, wielding even more power than usual heroes, but that is beyond what was recently the endgame anyway. There is certainly a lot to come back to – the game keeps growing. And you can still buy the new extras. The third group is those who haven’t played before and don’t plan to subscribe. They get to make only two characters Â in total (unless they pay for more character slots), and won’t have shiny stuff (unless they pay for it). But it is “Free to play. Forever.” as the slogan says. Obviously it is not actually forever. Eternity is forever. But if you want to hang out with us heroes (or the despicable villains, but then you wouldn’t be reading this website, right?) for free, you can do it now. Enjoy your flight – or your superspeed, if you so desire! 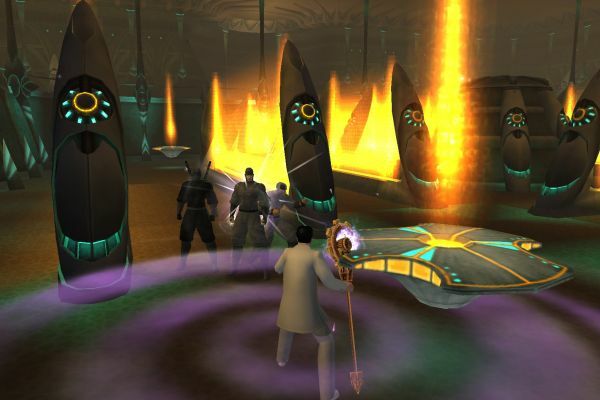 This entry was posted in games, review and tagged City of Heroes by itlandm. Bookmark the permalink.